MSI understands pumping applications. There are many joint innovations that are available for pumping assemblies. 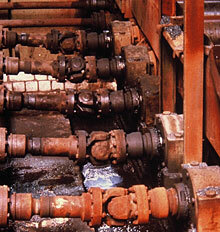 Some include lubed for life, special composite tubing and unique coatings to protect drive shafts in hazardous environments. Whether it’s a new application or servicing an existing universal joint drive shaft, we stock the products you need and can assemble them for immediate shipment. Our highly trained technicians and engineers take pride in finding solutions to your critical requirements.